Nadine Dereza was asked to facilitate the HBAA Forum last month. 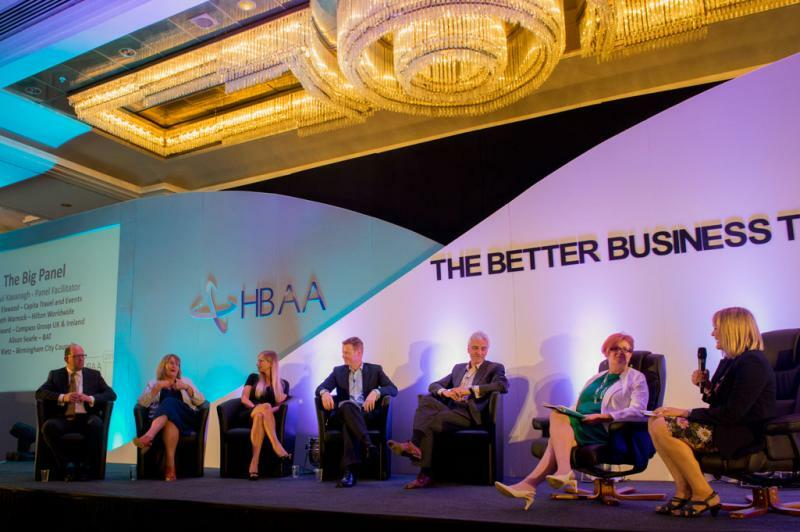 And if you haven’t heard of the HBAA before, well it’s a dynamic trade association for the hotel booking agency, apartment and venue community, and so the audience was formed of the great and good from the industry, eager to share knowledge and ideas. One of the benefits of writing a book called Insider Secrets of Public Speaking is that we are often asked to talk about the contents, and as result HBAA asked Nadine and Ian Hawkins to also present a session on Crisis Media Management specifically for hotels and venues. To put a twist on the old advertising slogan, we didn’t make a drama out of a crisis, but we did manage to make a PowerPoint presentation out of several bad news stories that struck a chord with our audience. It’s a well-established approach to speaking at a conference: take your general points, research for industry-specific examples, and always be on the look out for things that contradict your tried and tested principles. Oh, and try to avoid clichés (full marks in this case for not mentioning Fawlty Towers). During the research and build of this particular presentation, it became clear that hotels and venues had a particular issue that standard Crisis Media Management sessions didn’t really cover: the ubiquity of online customer reviews. Before Nadine and Ian began their presentation, Jonathan Bradshaw from Meetology opened the day’s proceedings with an energetic and provocative look at some of the research that’s been done on human interactions. What are the nudges that can get someone to say ‘yes’ to a deal or change their mind about something? Jon offered some great practical insights, such as the finding that people are more likely to agree to buy when they’ve been given a warm caffeinated drink, or give more money to a charity tin rattler who is standing at the top of an escalator. The take-home message from Jon’s presentation was that there are lots of things you can do to make a positive impact on an interaction, whether it is for business or pleasure (Jon himself left us in no doubt as to what scents we should be picking up next time we have time to kill in a departure lounge). Picking up on some of these themes, Nadine and Ian were able to talk about some of the big themes (and subtle ‘pushes’) around Crisis Media Management. Whilst it’s fair to say that the obvious examples of this are big stories on big media (think of the Costa Concordia dominating the front pages of the newspapers or Nick Varney, CEO of Alton Towers owner Merlin Entertainments being given the hairdryer treatment from Kay Burley on Sky News), the PS Programmes team were pleased to find that their section on responding to bad TripAdvisor reviews chimed with so many of the other presentations at the Conference. Condensing a day-long course of crisis media management training into a 45-minute presentation with audience interaction was always going to fall short of being comprehensive, but not only did audience responses reassure the team that the content was useful, it also gave PS Programmes food for thought when designing future training days. In a session called ‘Why Bad Reviews Are Good For Business’, Thomas Landen of Renivate talked through some of the facts and figures that are appropriate for hotels and venues, but which should raise eyebrows for anyone who has a customer online (hint: everyone). For example, 72% of travellers who complain on Twitter expect a response within an hour. Would a customer have different expectations if they were buying, say, a toaster rather than a holiday? Thomas next showed that customers are searching for businesses in social media rather than Google – and sites like Facebook push results to the top based on the experiences of our friends, not simply the best fit for that individual search. So if you’re looking for a Chinese restaurant in Chester, or a hairdresser in Hartlepool, the ones your Facebook friends rated should come up higher on the list than those rated by strangers. It’s worth thinking carefully about online reputation, because your definition for what counts as a crisis might change: according to Thomas’s figures, a hotel room that is scored 4.1 on TripAdvisor can expect to earn £45.99 more per night than one rated 3.9. And for every 1 point increase in rating, bookings increase by 14.2%. That 0.2 score makes a big difference to the profitability of a hotel, and it may only take the attitude of one member of staff to tip the balance in either direction. Does that count as a crisis? Even if you think that it doesn’t, is the resulting loss of revenue any different from a bona fide disaster? Between the three presentations, a clear strategy was unwittingly set out for delegates: Thomas showed the potential cost of failing to address reputational damage. Nadine and Ian gave some pointers of what to do in an emergency situation. And Jonathan provided helpful advice on building better relationships before and after such an event. A few days after the conference, Nadine was sent a copy of a 1974 speech – ‘Think Strawberries’ given by James Lavenson, president of Plaza Hotel – we are indebted to Maarten Tromp of Silversea for the tip – and what a relief that it chimes with some of the advice outlined in Insider Secrets of Public Speaking – proof, if it be needed, that some things don’t get old. Mr Lavenson talks about transforming receptionists, waiting staff, bell hops and cleaners into salespeople, and turning around the attitude from ‘if the guest wants something, they’ll ask for it’ to ‘always offer an opportunity to spend more’. It was regarded as ahead of its time when he originally said it, and although some may see it as old hat now, it’s still a lesson yet to be learned in some quarters. Read his obituary in the NY Times and in the light of the HBAA Conference, wonder what fun he would’ve had with TripAdvisor. The conclusion we can draw is that there are crises and there are crises: your company might find itself in the eye of an old fashioned media storm, with board members being doorstepped, unwary colleagues speaking out of turn, and customers telling you they’ll never darken your business again. More insidious, though, is the low-level social media grumbling that turns off new customers and repeat business and eats away at your margin. And who causes these grumbles? Frontline staff who face the customer. You can have all the strategy you like, but if the people on the ground don’t care about the customer’s experience one way or another, you’re going to find the points dropping off your score before you can say ‘hashtag’. The top of the company can prepare for media crises, but the bottom of the company is going to be directly responsible for how the social media reviewer reports back to their peers.